Since few years back I have tried to avoid Antibiotics at all cost, as I do not want to depends on medication to build my immune system. This is especially after I learnt that if we stopped the antibiotics before the prescribed dosage, our body system will need a stronger dose to fight the same virus next round. In mid May, I caught a serious flu, just before I managed to recovered, Kpo Kia caught the flu virus as well. We went to see the PD, and everything seems to be in good hand… somehow in last week of May, Kpo Kia’s condition suddenly worsened. When the childcare teacher feedback to us that Kpo Kia’s running nose has been getting more serious and suggest us to bring her to see a doctor, we decided to bring her to the nearest GP that is opened in the late evening. Being told that Kpo Kia was sicked for almost 2 weeks and now with green mucus, the GP suggested to give her antibiotics. Since this is ‘professional advice’ and likely the quickest way to help Kpo Kia recover, we agreed to it. When the nurse dispensed the medicine to us, she warned us the antibiotics ‘might caused a bit of loose stool’. Little did I know ‘a bit of loose stool’ is an understatement. Kpo Kia had her first dose of antibiotics on Wednesday evening. On Thursday, we were told by the worried teacher that Kpo Kia had passed watery stool that stained her clothes twice in the day. We didn’t take it on heart as we know ‘antibiotics might caused a bit of loose stool’. 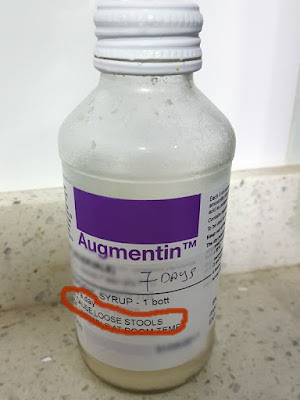 Friday, the teacher called me and told me Kpo Kia had stained herself three times due to the “watery stool that does not comes with any smell” – which she deemed “abnormal”. To address the teacher’s concern, Kpo Kia Papa ‘fly’ down to the childcare and brought Kpo Kia home. For the next 2 days over the weekend, Kpo Kia experienced “severed watery stool” which leak out like a tap, and she even got diaper rash. It’s a known fact which antibiotics can cause diarrhea (although usually it’s more common in children aged under two years, and can occur with any type of antibiotic). When antibiotics kill harmful bacteria that cause infection, they also kill the “good” bacteria inside the child’s intestines that help to digest food. These bacteria can cause diarrhea when they die and start growing again in the intestines, in most of the cases, antibiotic-associated diarrhea is mild. Antibiotic-associated diarrhea happens when child have loose or watery stools while taking antibiotics. Most of the times, diarrhea lasts between one and seven days.Diarrhea usually begins between the second and eighth day of taking an antibiotic, but in some cases, it can last from the first day of antibiotics until a few weeks after the child finishes them. If child’s diarrhea is mild and otherwise well, caregivers should continue the antibiotics and care for child at home. Keep the child hydrated, offer water instead of fruit juice or soft drinks, as they can make diarrhea worse. Keep giving the child what he normally eat, but do not feed him beans or spicy foods. cover the area with a layer of petroleum jelly, zinc-based cream or other diaper rash cream. show signs of dehydration, such as less urine, crankiness, fatigue and dry mouth. OMG! Apparently we made the wrong choice. Chinese sayings says “欲速则不达“（haste brings no success）, us trying to get her recovered fast only ended up having all of us suffered – with a cranky toddler who keep vomiting and having loose stool, and a pair of tired parents who need to wake up in the middle of night to clear her vomit objects and stay alert in day time to ensure “no accident” (of stool) happened. In future, I will let Kpo Kia slowly recover by her own, to built her immune system, rather than depending on antibiotics which might caused her serious side effects. So yah, I had been taking her good health in the past 19 months for granted, it’s only when things happened as such then I began to take note on the children medicine and their possible side effects. Hope your Kpo is in good health now. Poor baby. A good reminder that we should never take health for granted.